The church works because of your financial gifts. Your gifts fund the good works that allow us to serve the world and serve the member of our congregation. Thank you for your generous support of NDPC. 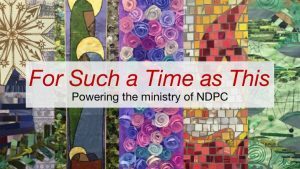 NDPC relies on the generous support of its members. Though we do collect an offering during worship services, we encourage members to fill out pledge cards to allow us to better allocate resources. Learn more.